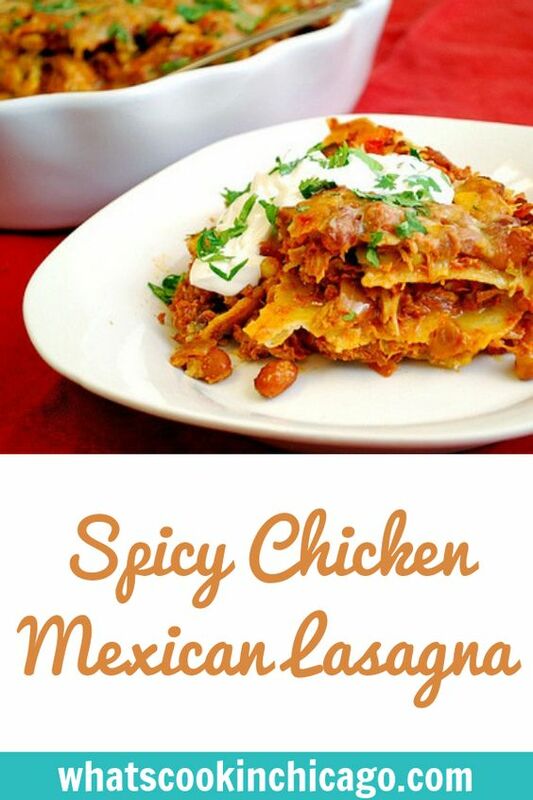 Article first published as Spicy Chicken Mexican Lasagna on Blogcritics. No, I'm not trendy... at least, when it comes to diets. Having been gluten free now for over a month after finding out about my gluten intolerance/sensitivity, I'm learning how some folks are quick to judge my reasons for gluten free living is more of a trend than an actual need. And along with these judgements comes the idea that gluten free living is a life of boring food. Wrong! 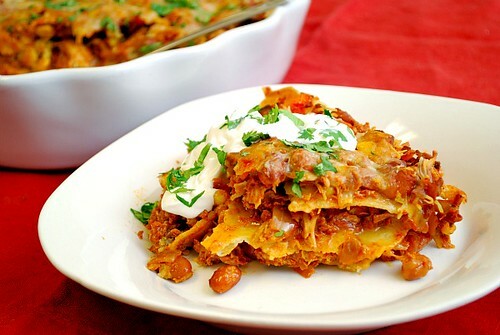 Take for example this Spicy Chicken Mexican Lasagna. It's far from boring with a spicy chicken filling layered in between corn tortillas and warm melted Colby Jack cheese. This is a hearty Southwestern spin on a traditional lasagna that has some personality and a little kick of heat! Being gluten free, corn tortillas are a staple at our house. Aside from tacos, I love using them for Mexican lasagnas... and this is probably my most favorite Mexican lasagna yet! You can go about this a couple of ways. You can roast a whole chicken to use in this dish or for the sake of convenience, you can use a store-bought whole rotisserie chicken. Other options include using all chicken thighs, drumsticks or even chicken breasts... and deboning/shredding the meat to use in the recipe. It doesn't matter what cut of chicken you use since the magic is all in the seasoning of the filling. If you prefer not to have that spicy kick from the chipotle peppers, fee free to omit them! This recipe is one you can tailor to your tastes however you'd like. It's also one that you can make ahead and/or freeze. I've included direction to do this below after the recipe too. In a large skillet over medium high heat, add the vegetable oil. When hot, add the onion and garlic and sauté until softened. Add the shredded chicken and spices, tossing to coat. Continue adding the remaining filling ingredients along with the 1/3 cup cilantro, lime juice and salt and pepper to taste. Simmer for 10 minutes to blend flavors and remove from heat and set aside. Meanwhile, adjust the oven rack to the middle position and preheat the oven to 350 degrees. Coat both sides of each corn tortilla with vegetable oil spray and arrange the tortillas on a rimmed baking sheet (tortillas will overlap), and bake in the preheated oven until the tortillas are soft and pliable, about 2-4 minutes. Remove from oven and keep the oven on. Coat the bottom of a 9x13 baking dish with vegetable oil spray. Spread one-third of the filling on the bottom of the baking dish. Layer 4 tortillas on top of the filling, overlapping as needed, and sprinkle with 1/2 cup of cheese. Repeat with one-third more filling, 4 more tortillas and 1/2 cup more cheese. Spread remaining filling over the top and cut the remaining tortillas into quarters. Scatter these tortillas over the filling and sprinkle with the remaining cheese. Bake in the hot oven for 30-45 minutes until bubbling and golden. Let cool for 5-10 minutes before serving. To serve, sprinkle with remaining cilantro and top with sour cream. * To make ahead/freezer meal: Prepare and assemble the recipe as directed as above in an oven- and freezer-proof baking dish. Instead of baking in the oven after assembling, cover the lasagna with plastic wrap and once again with foil. Place in refrigerator to chill for up to 24 hours to make ahead or place in freezer for up to 2 months before baking. To bake from refrigerator, preheat the oven to 350 degrees and bake in the hot oven for 30-45 minutes until bubbling and golden. Let cool for 5-10 minutes before serving. To serve, sprinkle with remaining cilantro and top with sour cream. To bake from frozen, allow to defrost and preheat the oven to 350 degrees and bake in the hot oven for 30-45 minutes until bubbling and golden. Let cool for 5-10 minutes before serving. To serve, sprinkle with remaining cilantro and top with sour cream. wowwww....looks so yummy, i just love chicken. I cant wait to make it myself and have it. Joelen, this looks sooo good! It looks so yummy! I'm definitely going to have to add this to my arsenal of freezer meals. This looks absolutely delicious! Thanks for sharing such an amazing recipe! Can't wait to try it! I love your photographs...do you use natural light? Thanks Karly! I use natural light as often as possible but I love using my external flash/speedlight for times I don't get enough natural light. This is really delicious! I mentioned this blog to my mom and she was searching for a lasagna recipe. We tried it and we loved it! Thanks for sharing, you never let me down. Thanks! 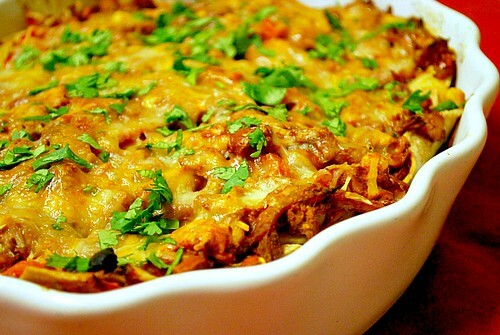 It's called Enchilada Casserole. I'm 57 & have eaten it all of my life. This spicy chicken lasagna is breath taking recipe and for this one I must say nothing but another great recipe for me to bookmark. This was very good! The family loved it! Thanks. Must try this soon, thanks for sharing.